As parents, grandparents, educators, and librarians one of the greatest gifts we give to children is literacy. Whether by providing a variety of books, reading a good book aloud, giving encouragement when acquiring new skills, or helping find the perfect book, we guide children toward embracing literacy. Once a child finds literacy they are on their way to discovering themselves. Bryan Collier is the illustrator of more than twenty picture books including three books that were awarded a Caldecott Honor Award; Martin's Big Words: The Life of Dr. Martin Luther King Jr. by Doreen Rappaport, Rosa by Nikki Giovanni, and Dave the Potter: Artist, Poet, Slave by Laban Carrick Hill. At the age of four, Bryan's mother brought home the books The Snowy Day and Whistle for Willie by Ezra Jack Keats and Harold and the Purple Crayon by Crockett Johnson for him to read. His mother probably knew he would enjoy reading about Peter and Harold in these books when she chose to bring them home. What she didn't know is how important these books would be to his life. Bryan Collier said, "For the first time, I saw me in a book. "(National Book Festival). These books made an impression on Bryan and when he was 15 years old he decided that he wanted to be an artist (SLJ). In an interview with Reading is Fundamental he said, "I was supposed to play college football, but chose art at the last minute. I knew I wanted to be an artist and be in New York." He went on to receive a scholarship to Pratt Institute in New York City and later graduated with a fine arts degree. He developed an art technique that combines watercolor and collage. "Mostly, I just use old fashion magazines for their patterns and inspiration for creating mood or light. I will see a pattern on a dress and also see the color schemes. I incorporate the collage in my work; there is no real rhyme of reason on how. There isn't more watercolor than collage or collage than watercolor. It just has to feel right." (SLJ) After graduation, he remembered those picture books by Keats and Johnson and decided he wanted to create books for children to enjoy just like he did at a young age. It wasn't easy for Bryan Collier to get started in children's books. 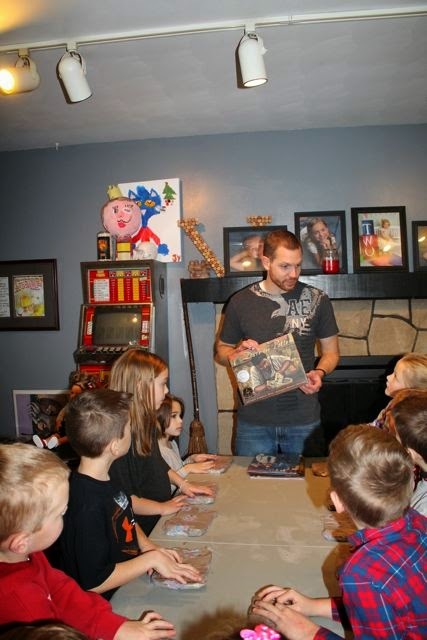 For seven years he presented his portfolio to publishing houses before he was offered his first picture book contract. Bryan Collier's first book was Uptown which he wrote as an "ode to Peter, Keats, and The Snowy Day." (SLJ). The book went on to win the first ever Ezra Jack Keats New Illustrator Award (2001) and a Coretta Scott King Award. During his career, Bryan Collier has received a Coretta Scott King Award seven times; three of those in the last four years! The latest was the 2014 Coretta Scott King Award for illustration for the book Knock Knock: My Dad's Dream for Me by Daniel Beaty. He was also a 2014 U.S. nominee for Hans Christian Anderson Award. I met Bryan Collier at the National Book Festival in September 2014 and he happily shared his birthday with me as he signed our copies of Rosa and Dave the Potter. Both of these books I highly recommend reading with your children. 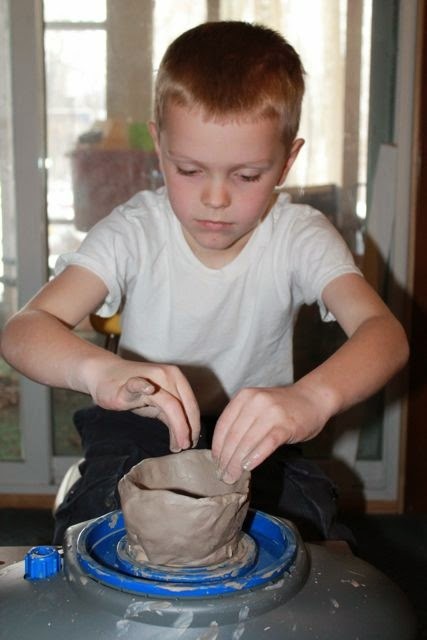 As I read Dave the Potter, I imagined reading the book with my children around a potter's wheel with their hands wet with clay and water. Bryan Collier's birthday was approaching and we were at our friend's house shortly after the holidays. 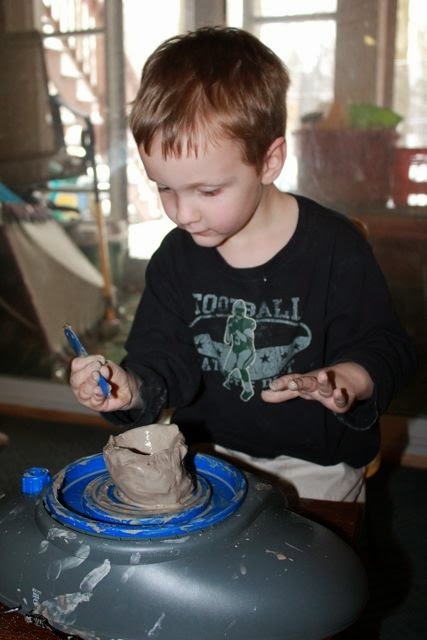 I noticed that one of their boys received a potter's wheel for Christmas; not a real potter's wheel found in a studio but one designed for children. I said, "I would love to borrow that potter's wheel in about a month!" Fast forward one month and not only did I get to borrow the potter's wheel to celebrate Bryan Collier's birthday with my family but our friends also came over to spend the afternoon together. 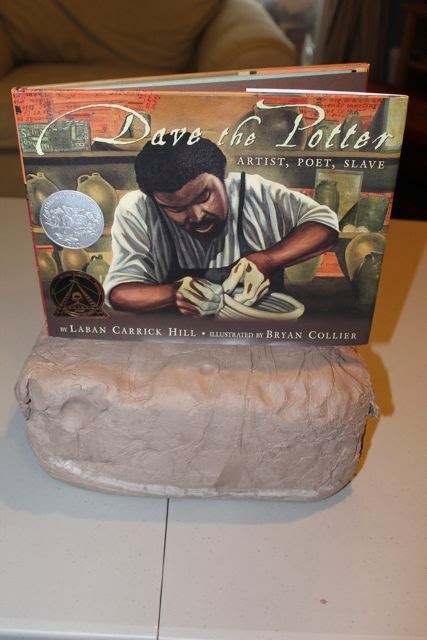 Dave the Potter: Artist, Poet, Slave by Laban Carrick Hill is about a real man who lived two hundred years ago in South Carolina. In his lifetime, it is believed that Dave created forty thousand pots. According to the book, "Dave did not write on the sides of his pots, perhaps he knew it was not safe. He would sometimes just sign his name." Later, Dave "boldly" added lines of poetry to his pots. Bryan Collier said in his National Book Festival presentation, "The book is about pottery, slavery, American history, poetry. But, it wasn't until I finished the whole process when I discovered it is about literacy." 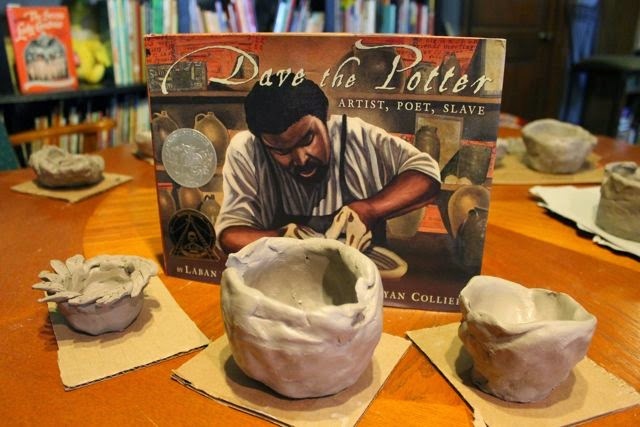 The words and pictures of this book allow the reader to experience Dave creating a pot; starting with gathering the clay, mixing with water, and throwing the clay on the wheel to adding details, glazing, and inscribing his words "to let us know that he was here." I purchased 25 lbs. of gray clay on Amazon. 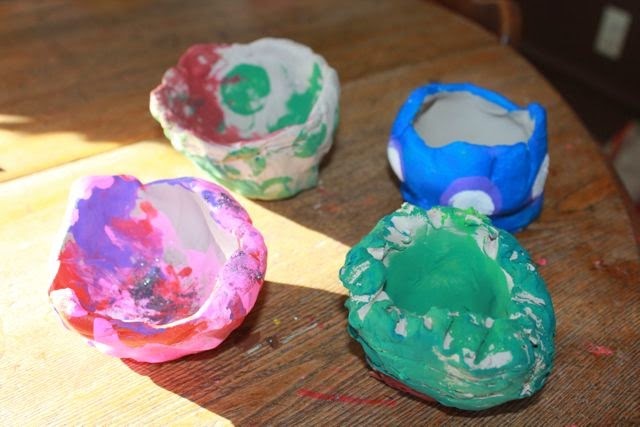 This was plenty for our group of 11 children and five adults to make pottery. 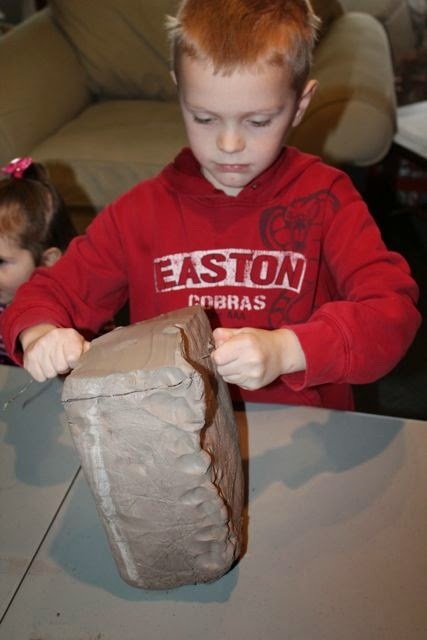 Before our group of friends came over my oldest son used a wire to cut chunks of clay for each of his friends. 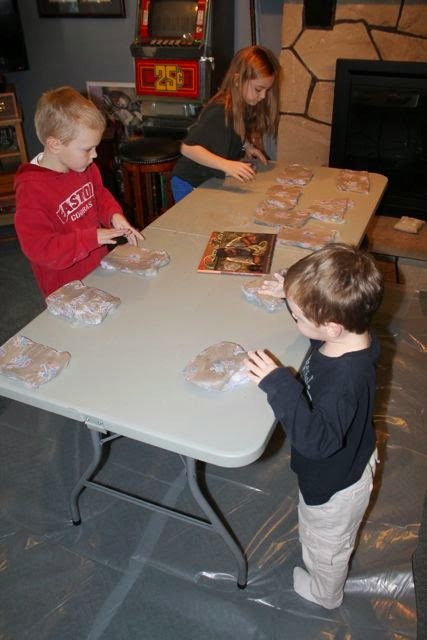 We set up a table in the basement and lined the carpet with plastic. I didn't want clay in the carpet! We covered all the clay with plastic wrap to make sure it didn't dry out while waiting for our friends to arrive. We started by reading Dave the Potter. The children were curious about the award medals on the front of the book. We talked about the Caldecott award and Coretta Scott King Award. Bryan Collier talked about the importance of the Coretta Scott King Award with School Library Journal, "The CSK says that artists of color are equal to anything that is being made anywhere. If you take that away, we may not get recognized. That is a very real and sobering reality. If the CSK award wasn't in existence, many artists would be overlooked. It has a hand in cultivating new talent." I love this fold-out illustration of Dave "pulling out the shape of a jar." 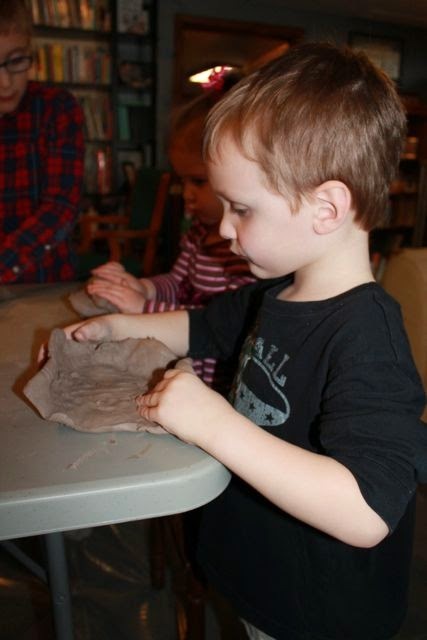 All the children began by kneading their clay to remove any air bubbles that may have been present. 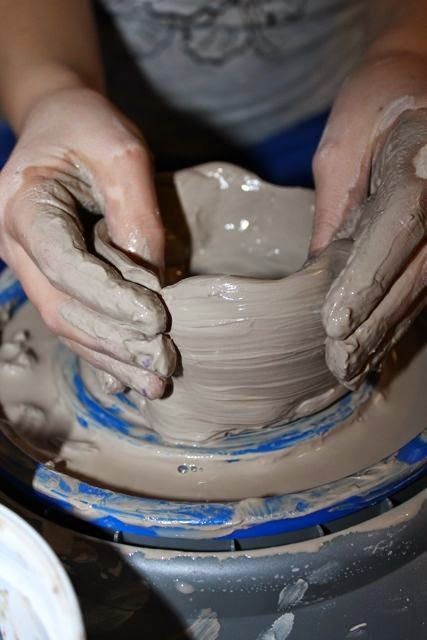 Many of the children formed pots or bowls without the use of a potter's wheel. 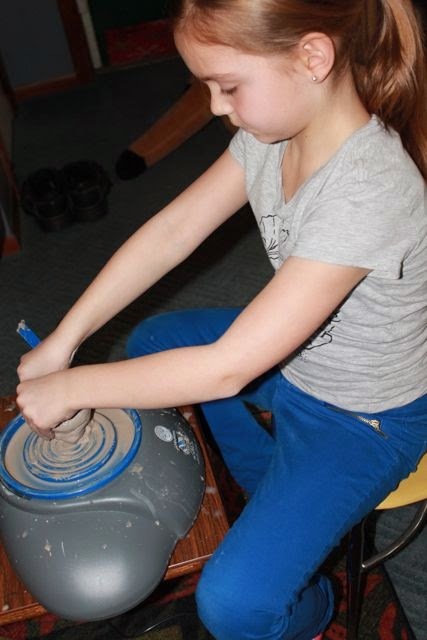 Many of the children tried the potter's wheel too. 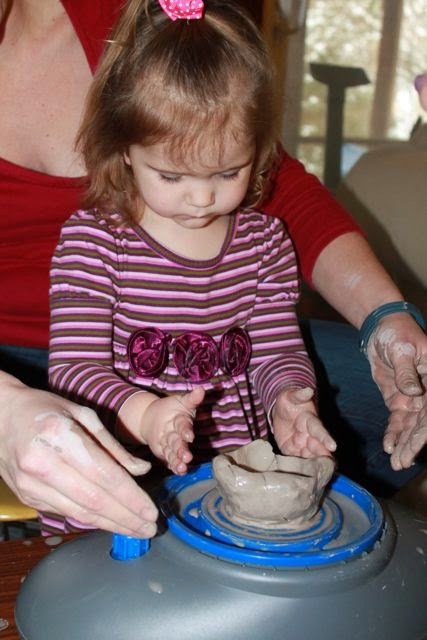 My oldest daughter learned that there was delicate balance needed when using the potter's wheel. There were many things to think about; pressure with your hands, not adding too much water, etc. My oldest son was a natural, as were many of the children. 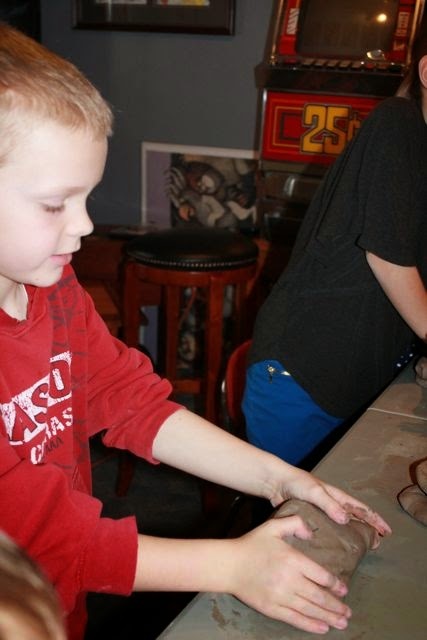 My youngest son loved using some of the provided plastic tools to add scrapes and dents to his spinning clay. "Hands, buried in the mounded mud." 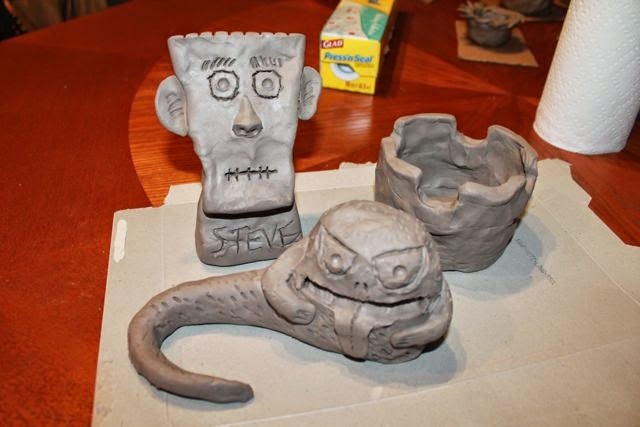 These three couldn't stop shaping and forming the clay into fun creations. My creative buddy outshined everyone with his artwork! 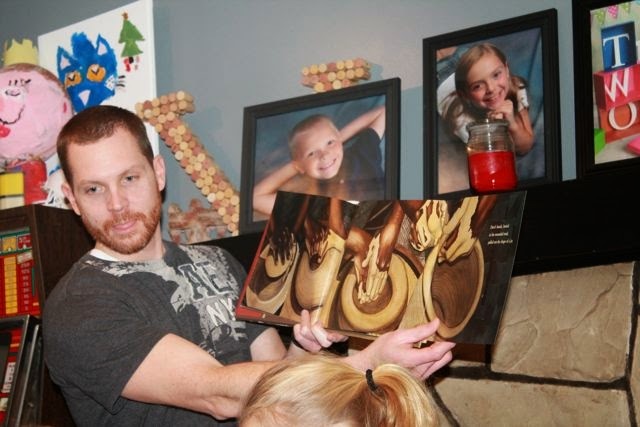 Our families were brought together because of art, poetry, and this amazing picture book. 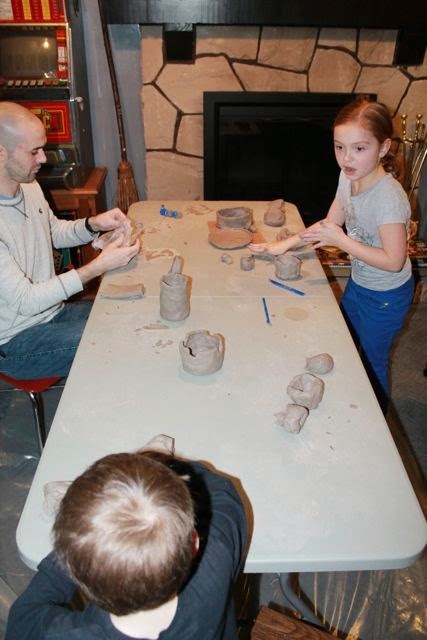 We had so much fun, and who knows maybe there is a future potter in our group! Bryan Collier, we hope you have an amazing birthday. Thank you for sharing your birthday with us at the National Book Festival. 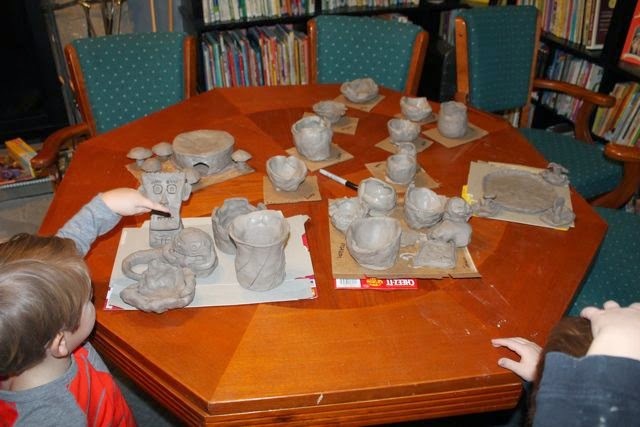 We allowed our pottery to dry for about 10 days. Then, we painted with acrylic paints. I think they turned out great!